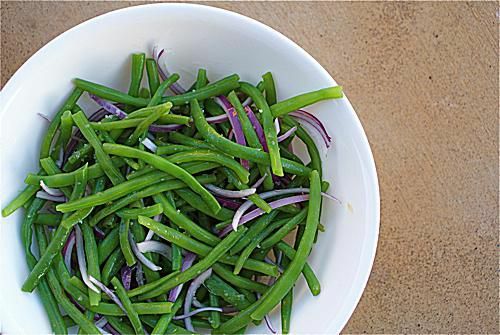 Simply steamed green beans and thinly sliced red onions make a delicious and beyond easy summer salad. It almost seems too simple, doesn't it? And yet this is one of those combinations where the whole is greater than the sum of its humble parts. Is it the pungent onion against the humble beans? The bright dressing? Or just the snap of bright summer flavors coming together? All of the above, I'm sure. Since the beans just get better, in my opinion, as they wilt into the dressing, this is an excellent dish to file away for summer potlucks, barbecues, picnics, and other gatherings where you want food that can hang around a bit and stay delicious. Trim the green beans. How much you trim them is a combination of the type of bean at hand and personal choice. Old-fashioned string beans need that string pulled off; even though many beans have had the strings bred out of them, I still like to snap the ends off, even though some may see it as a waste of time. Bring 1/4 cup of water to a boil in a large skillet over high heat. Add the beans, sprinkle with salt, cover, and cook until the beans are crisp-tender and the water is evaporated, about 3 minutes. Rinse the beans with cold water, pat them thoroughly dry, and set them aside. In a large bowl (large enough to toss all the vegetables), whisk together the oil, vinegar, and mustard. Add salt and pepper to taste. Put the cooked beans and the sliced onions in the bowl with the dressing and toss to coat the beans and onions thoroughly. You can serve right away or let everything sit and marinate a bit before serving (if you're going to hold it more than about an hour, cover and chill). The best way to taste a salad dressing is to dip an element that will go into the salad (in this case a green bean) into it and take a bite—it gives you the best context for assessing the final flavor.